Back in college, I used to make sandcast candles and then macrame holders for them – they could be hung from the ceiling. A lot of guys in the dorm bought them from me. I was a little bit of a flower child, I guess, at least my crafty things made people think that way. I started playing with making candles again a few years back. I made a few sandcast candles, but everyone thought they were just weird, so I’m not really making those now, though I would if someone wanted one. 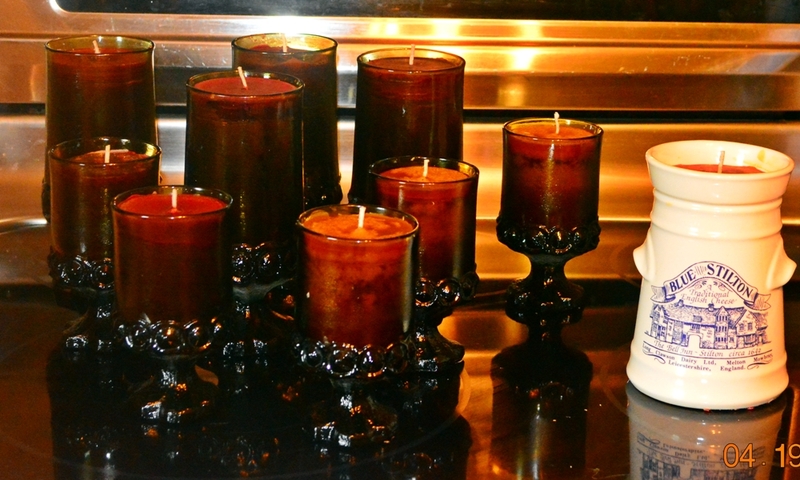 I have been finding vintage containers – teacups, wine goblets, odd containers, and then making them into candles. I enjoy playing with the scents and colors. I’ll be bringing them to the Atchison, Kansas Open Air Fair this coming Saturday. Here is a sneak preview of those I made yesterday. Half are cinnamon scented, the others are vanilla. This entry was posted in Candles, Castle Argghhh Creations Available and tagged Arts and Crafts. Bookmark the permalink.